hello, where can i find the always on top, while playing using UT HD Player ? The update is only going out to part of the userbase. You could just update manually though. After the latest update, my torrent froze after i added a couple downloads trough magnet links. No matter what i do the utorrent freezes almost instantly upon starting. 1. The WORKAROUND I use is to remove that torrent from uTorrent & rename the completed torrent directory to something else. 2. Then enable Pre-allocate all files. 3. Re-add that torrent & start the transfer and after a minute the entire "size" of the original torrent has now been allocated on hard disk. 4. Next do a force re-check on this Pre-allocatted torrent. 5. Your completion percent should be negligibly small, 0.01% or less. 8. You can now continue to re-seed your torrent. I know it is a PAIN, but this issue seems to ONLY affect certain torrents with very specific characteristics... They introduced this BUG quite awhile ago in their version 3.x, I guess... Alot of Asian torrents with CJK filenames will also produce this BUG... hence, most/many asian sites has moved away from using uTorrent. I've read many negative posts on new 3.1.3 version, and previous update versions. Until 3.2 Stable version can be released and secured without bugs, and there is positive feedback on it. I will stay with 2.0.4 version. I've never had an issue or problem to be fixed on it, so you must have done something right with this one, as it remains Solid and Stable. What is the point of the function then? I mean, I do not usually check the forums too often, so how am I supposed to know there is a new version? It could fix major bugs or security stuff. Not very often, but it does happen from time to time. It could fix major bugs or security stuff. It could also crash on you if there is a bug in it... Gradual upgrades is for your own good. I just had one of my torrents finish and it moved the file as I have set up in the options but when I 'Open Containing Folder' on that file it opens up my user directory instead, so the obviously the link to the file is borked. I restarted the client and it's the same deal. If I click on any other non downloaded file from the torrent it opens up the directory fine, it's just on the file that's 100% completed that's not linking. Are there any fixes implemented for this in either 3.2 or 3.3? I found out my utorrent stops responding when trying to add certain (not all) magnet links. Links were from the same site though, and the files were .mp3. When i run the rest of the torrent and the ones from magnet links (0.0% done) are stopped it works normally, when i start the magnet linked ones it just stops responding. Well it's good to see that other people are seeing this crash. That saves me the time of loading up a hardware debugger and trying to find this bug myself. It's way to nice of a day. it looks as if the UI of utorrent crashes but the torrent themselves keep downloading. My current work around is simply to kill utorrent and restart it to see the status of my downloads. No any words about 3.1.3 build 27167 ? Yea,I saw on another forum that this build is released. Digital signatures is 05.May 2012. No changelog again... wow... this is becoming annoying. Uh, this is how it has been... I think that the Changelog should be made public immediately with the program. Or is there some against it? 27167... should i bother with this when i get home? i wonder if asking for admin rights on Win7sp1 x86 has been fixed yet. i'm currently @work, on an XPSP3 x86 system but it's not showing that error when starting as limited user even with software restriction policies active. I reported this issue with win7 on page 5 of this thread (post #118), uT was then at build 27060.
and he does the same thing as me, replaces the executable manually in program files. The only difference i can see is that he uses win7 x64 while i use x86. since then, i last tried tried running 3.1.3.27120 on win7 as admin from a different directory and letting the built-in installer do its thing thinking that maybe it needed to update some registry settings and would not reach that point if it detected it was already being run from program files. After the installer completed successfully, the first time i tried to run it as a regular user, it asked AGAIN for admin rights. ... i deleted 27120 and went back to 26837, that one doesn't have this annoying (and potentially unsafe) behavior. Hello. 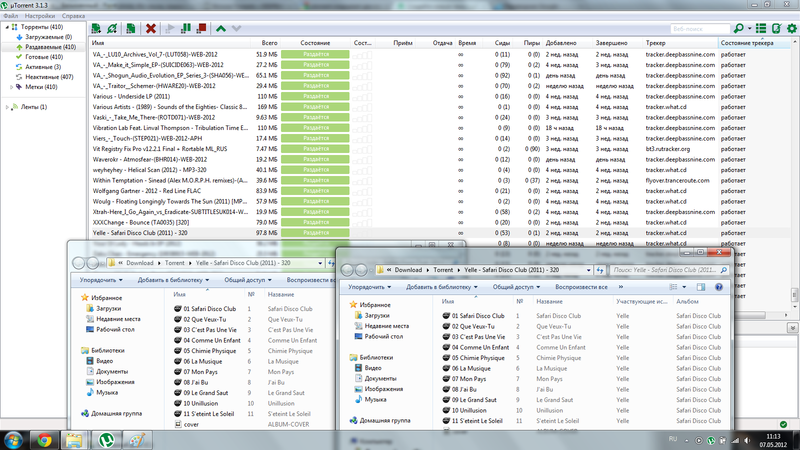 The latest version of utorrent, open two windows in the file: (what could be the problem? version utorrent.1.8.2.15357, utorrent.2.0.3.21177 good work. i'm currently @work' date=' on an XPSP3 x86 system but it's not showing that error when starting as limited user even with software restriction policies active. Once the admin token is set on the file by Windows, it probably won't go away. Delete the executable in program files, DON'T COPY IT THERE BY HAND, and let the installer do its thing. 27167 does not offer any user-visible changes, just minor installer tweaks. one thing I have noticed with the alpha µTorrent 3.3 alpha (27150) and this beta µTorrent 3.2 beta (27138) is that is it connecting to my torrent sights they show me as un-connectable I do not know why this is when I uninstalled and went back to the current stable verson it worked fine. nope.. 27167 still asks for admin pw. i deleted the executable, moved settings.dat from the user profile just in case it was causing it to stumble (that file is 220kb in size) and then i let 27167 run its installer. That went fine but after i stopped it from its first run after finishing the install (was still running as admin following the install) and then i tried to start it as the restricted user account is asks again for admin pw. btw... when i need to install something i launch all the installs that require elevation from a command prompt running with admin rights, i don't use right click->run as admin because the admin pw is quite a lengthy one. However, i don't think that uT has issues with launches from an admin command console, does it? It might. Just try running it normally... It elevates itself.